Malwarebytes 2.0 has totally changed its appearance in this new release. The older Malwarebytes menu was arranged vertically, in the new version it is now horizontal. There are also improvements in signature updates it is now totally updating without user intervention, unlike the previous one that you need to interact with its pop-up, to run a database update. Basically, I don’t like the name. You are excluding malware? This is the replacement of Malwarebytes 1.75 Ignored lists. This is new, you can now add an IP address, Domain name and system processes in exclusion lists. It’s a good move by Malwarebytes because it helps online gamers, heavy downloaders and system administrators as well. Another new, this is designed for system administrators or advance users. It enables you to make policies for each user on your computer. Prevent them from accessing advance settings, general settings, detection settings and of course policy settings to protect your desired protection and password protect it. This is where you enable and disable your desired security settings. 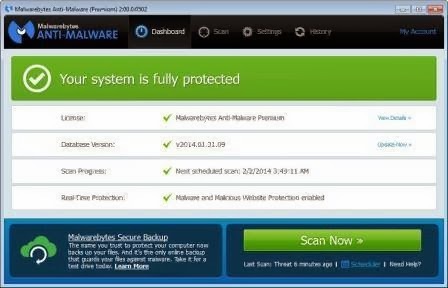 The Malwarebytes self-protection module which is powered by chameleon is turned off by default, so take the initiative to enable it here. Malwarebytes License policy also changed, from its one time $ 24.95 lifetime license to a yearly subscription of the same amount. This is for new customers, Malwarebytes still honors those who purchased and will purchase before the official stable release of Malwarebytes 2.0. The only advantage that the new license will bring is you can use it up to three (3) computers. What do you think about Malwarebytes 2.0 changes?